Steve theorizes that they’re instinctively practicing the moves that they would need, were they wild dogs who had to hunt for a living. Pretty much they’re the same moves they would use if they had to fight an enemy. But that makes it sounds like work to me, and they’re obviously enjoying themselves immensely. 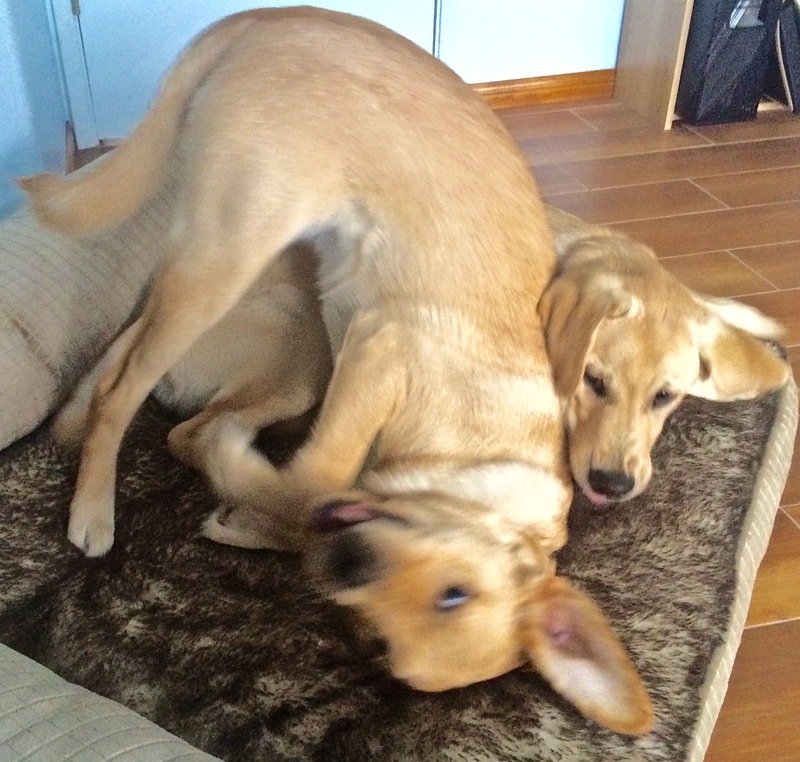 Their tales wag vigorously as they toss each other around. Today they did seem to calm down a bit, napping together and doing a bit of mutual grooming. But I expect a lot more of the more energetic activity till Hopi goes back to her own family Friday. It’s a puppy love fest! A party in the house! 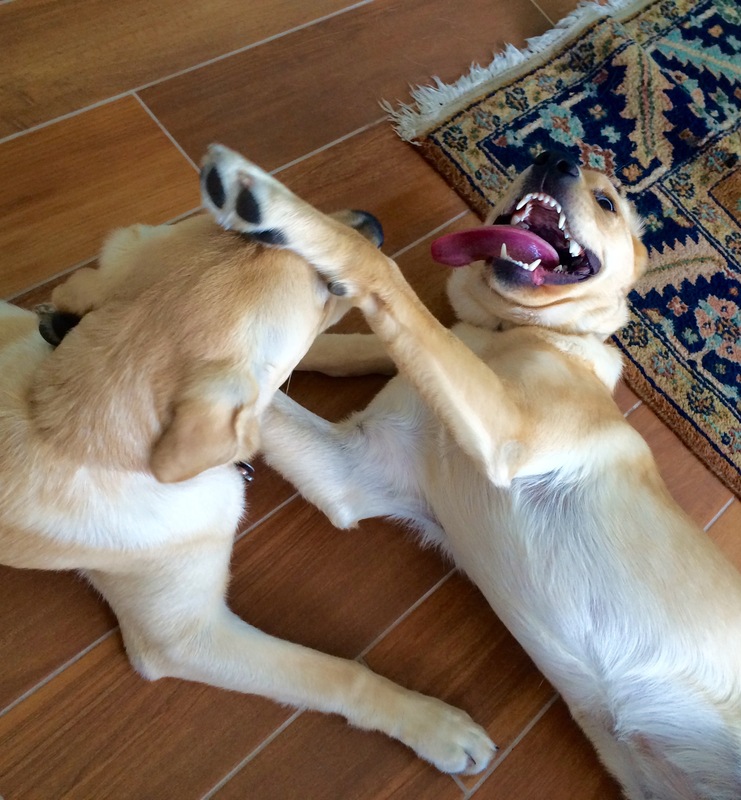 Kyndall is one happy puppy — and likely to remain that way for the coming week. About 3 p.m. today Hopi arrived. Hopi’s a 5-month-old CCI pup who’s in our Basic puppy class. When her puppy-raisers recently put out the word that they needed some sitting for her while they were on vacation, Steve and I responded. We see it in part as payback for all the help we routinely receive from the CCI “village.” But it’s also a way to spice up Kyndall’s so-often-boring routine. They’ve done a bit of racing around the yard at 100 miles per hour, but they can expect to only do a limited amount of that, I’m afraid. For one thing, Hopi immediately fell into the pool (an amenity she lacks at her home). But she redeemed herself by swimming quite calmly to a step, where she exited with no hint she needed life-saving. We can do without that. Otherwise, it promises to be a very jolly party. 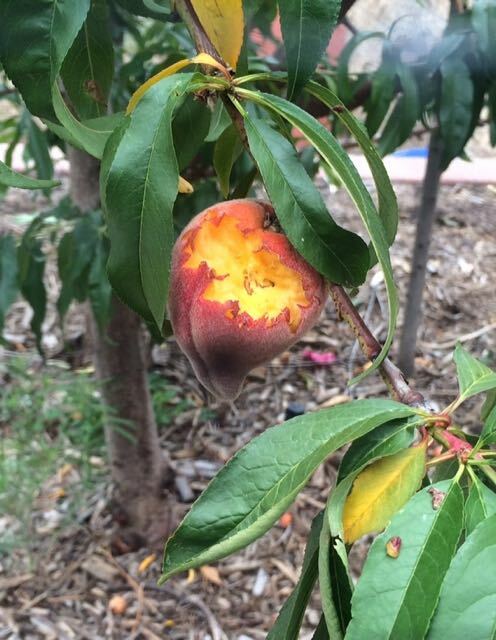 About three and a half years ago, Steve and I planted a cluster of peach trees in our back yard. The very first spring, we got a couple of delicious peaches, and the numbers have climbed each subsequent year. Only now, however, have we begun harvesting real drama. This spring the “May Pride” tree produced several dozen fruit. Many were very small, but all were beautiful, and the taste was complex and intense. Eaten alone or cut up and put on our cereal, they were everything I’d hoped for when we planted the trees. We tried to pick some every day, gathering any that had fallen to the ground; we worried that if Kyndall noticed how tasty they were, she might begin helping herself. And she did indeed start to raid them a few days ago. We responded by virtually never letting her out in the yard, unleashed. Instead the big trouble came from a different quarter. About a week ago, we started seeing chunks torn out of some of the fruit. The trees have had bird netting over them for months, but we figured some sly creatures had figured out how to sneak under the bottom of the nets and help themselves. So Saturday morning, we got out the roll of netting and covered the tree cluster much more thoroughly, draping the spidery barrier all the way from the crown to the ground. Sunday morning Steve checked and found many more gouged peaches. He added stakes to better secure the edges of the netting. Toward the end of yesterday afternoon, I took Kyndall out to pee and noticed a slight commotion from the peach cluster. It was a sparrow, trapped inside the netting and frantically trying to escape. Enraged, I responded by grabbing some of the netting. I tugged and bellowed, and the little brown bird somehow slipped out and flapped away. Then I noticed a second sparrow on the other side of the tree cluster. I went to tug at the net near it and scare it away too, and suddenly Kyndall appeared by my side. I screamed, “No! Don’t! DON’T!” But in an instant, she darted down and closed her jaws around the little bird. She couldn’t run away with it, because the sparrow was still on the inside of the netting. I was in a panic. As mad as I was at the sparrow for savaging our succulent harvest, I hated the sight of the helpless thing locked in Kyndall’s toothy grip. (Plus the last thing one wants to train a CCI puppy to do is to hunt and murder sparrows.) Still screaming, I grabbed her mouth and pried it apart. 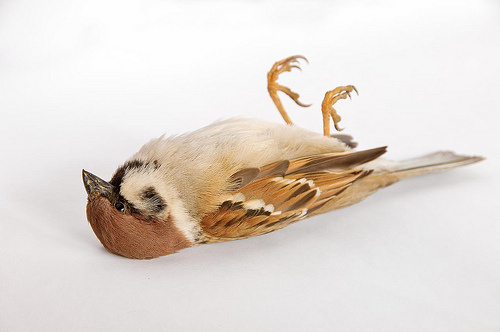 The sparrow fell out and lay still. It stared, frozen and dying, I was certain. But I couldn’t minister to it. I yanked Kyndall inside, and then I couldn’t bear the thought of going to retrieve the dead bird. A while later, Steve went out instead. And here’s the mystery: the sparrow was gone. We speculate that Kyndall actually didn’t injure it but only sent it into temporary shock. We’ve picked off almost all of the remaining ripe fruit. But here’s the other mystery: how in the world are we going to protect future harvests so that more marauding and murderous rampages doesn’t ensue? 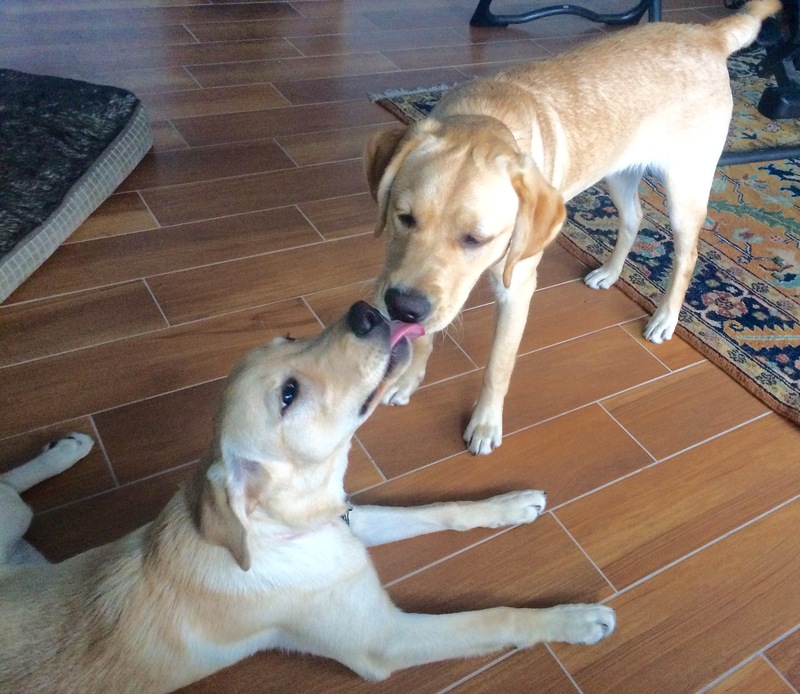 Steve recalls that Darby (CCI pup #4) often would lick the inside of Tucker’s ears. 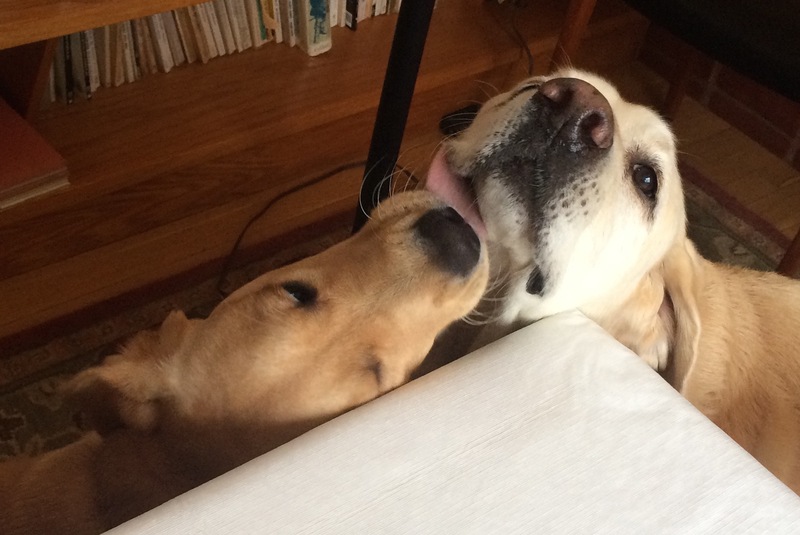 But what Kyndall does is different: she rushes up to Tuck and licks both sides of his mouth, usually wagging her tail enthusiastically as she ministers to him. I’ve looked online for opinions about what all this may mean and found several interpretations, including a) it’s a demonstration of subservience (“Let me lick your chops for you, oh master!”), b) an invitation (“GREAT to see you again; let’s play!”), or a sign of affection (“Kisses!”) Tucker takes it in stride, patiently standing there as she works on him. I had not noticed, which is surprising. Steve and I take some interest in our dogs’ tails. We were struck by the distinctive twist at the very tip of Dionne’s tail, which gave it a slightly porcine look. 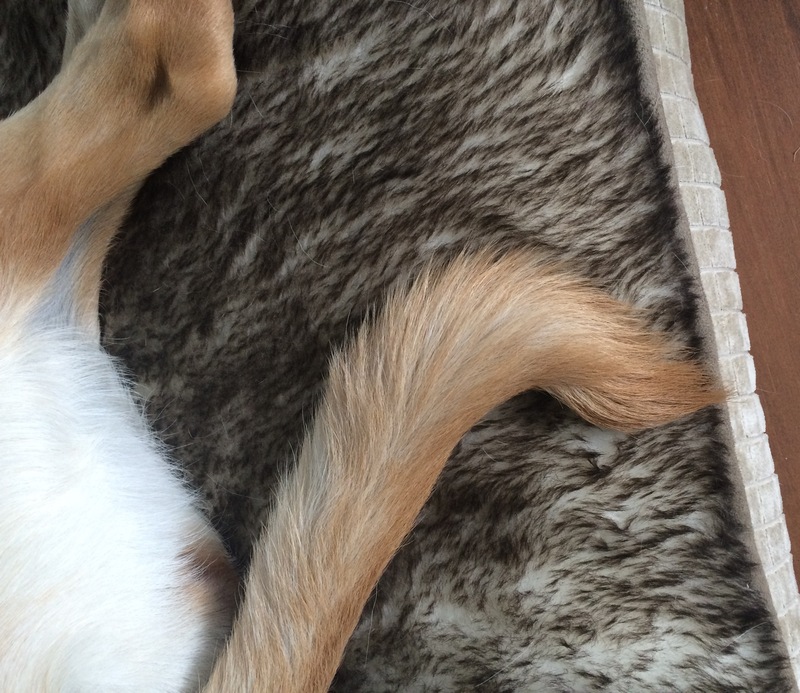 For some time, we also nursed a theory that the longer the tail, the more dominant the dog. This notion was fed by the fact that despite his size, Tucker has a rather wimpy little tail and a docile, submissive personality to match it. 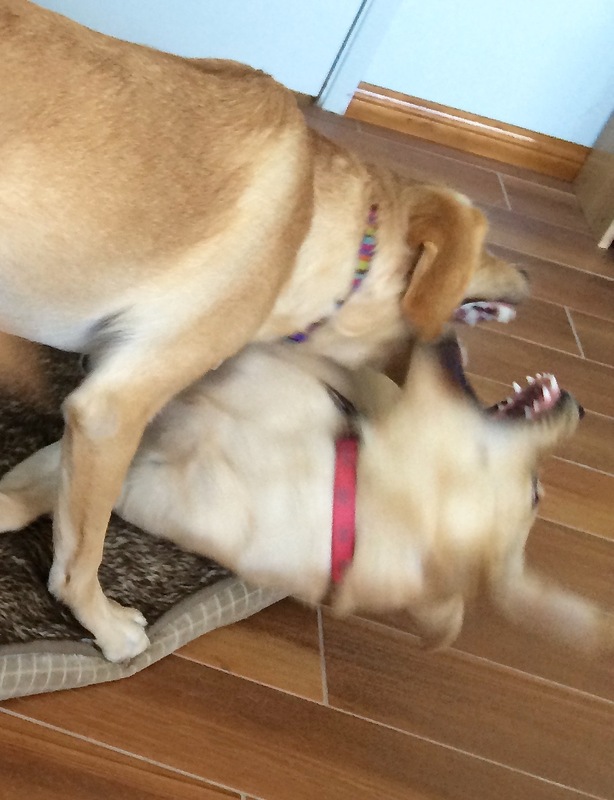 Dionne and Darby, while both smaller physically, had long tails and — bossed Tucker around unmercifully. But our Tail Dominance theory took a beating with the arrival of Kyndall, who has a nice long tail but is more subservient to Tucker than any other dog he’s ever lived with. If long, I saw that it is true Kyndall’s tail appears kinked, just about an inch from its end. If you feel it, there appears to be a clear bend there. “Do you suppose it’s my fault for pinching it in the car door that time?” Steve wondered. If so, he seemed ready to take credit for the effect. “I think it looks very stylish,” he pronounced. I don’t know if that’s the right word for it; the bend at the end reminds me of the way airline wing tips turn up these days. But one thing we all agree on: better a kinked tail than a drooping one. 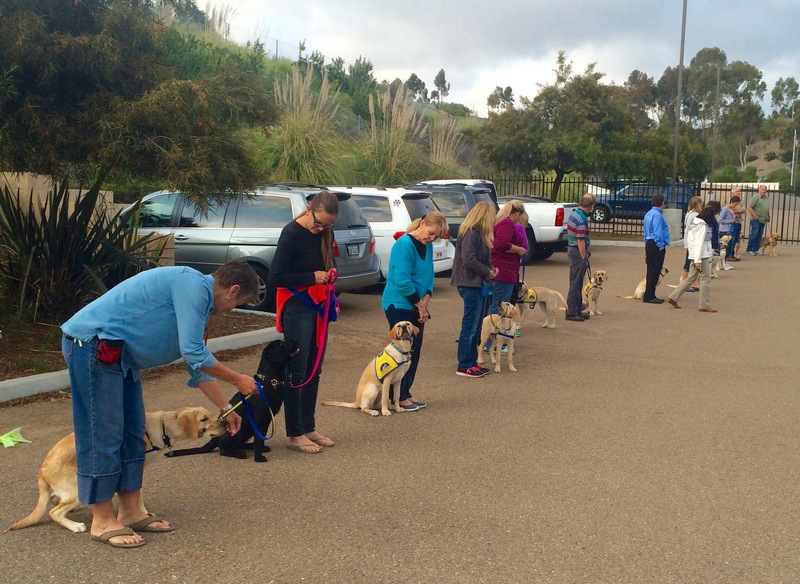 The second set of CCI’s puppy-training classes is known as Basic. For us, the session began when Steve and I were traveling, and Kyndall was staying at Cabernet’s home. The second class of the session was last night, however, and we attended — along with every other puppy-raiser in the Western Hemisphere. Or so it felt. 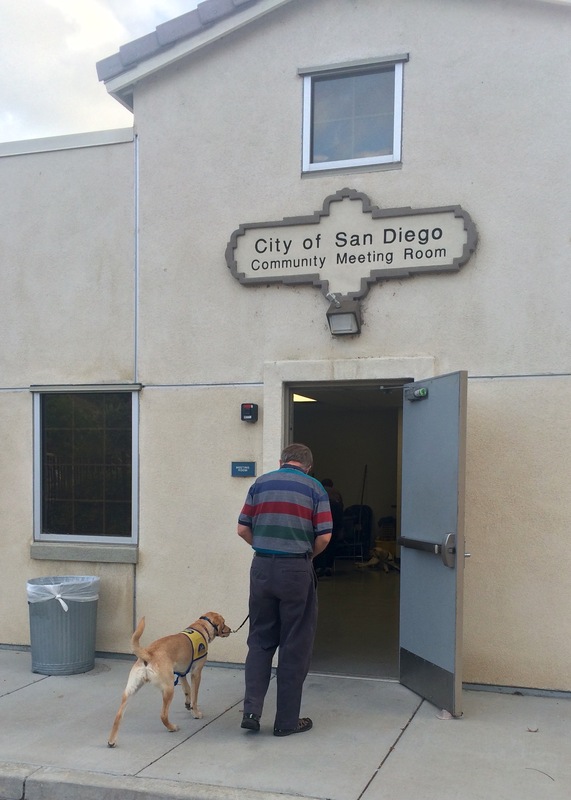 I counted a total of 16 dogs, more than I’ve ever seen in any class in San Diego. It was pretty overwhelming. The community room barely contained us all. The bad thing about being in that large a group is that it takes so long to cover any given command. But Bob, our instructor, compensated in a couple of ways. He began by having us all go out and line up in the parking lot. Then he instructed us to walk the dogs, one by one, in a “serpentine” pattern, with each dog threading its way among all the others in the line. This wasn’t even all the dogs. My iPhone lens wasn’t wide enough to capture them all. 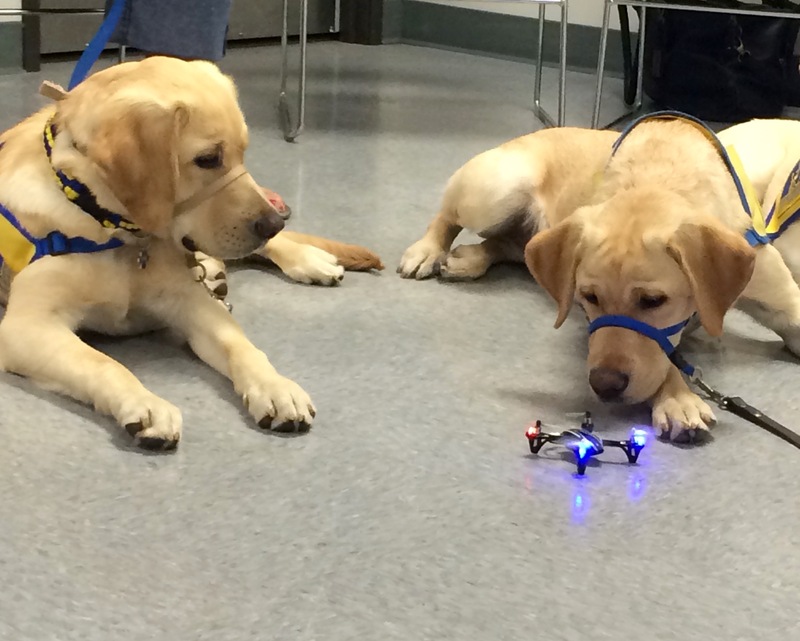 They may be in Basic class now, but they’re all still pretty young pups. 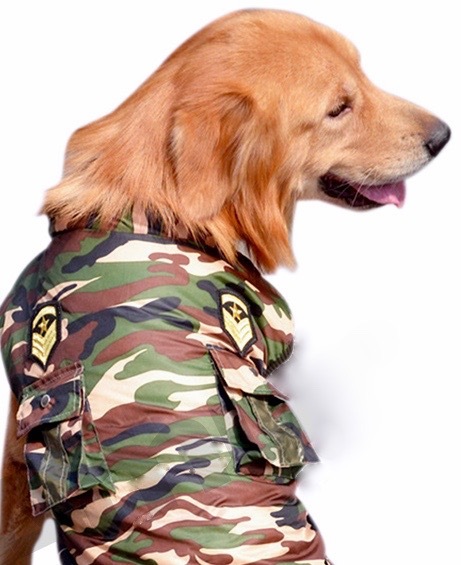 Considering that all the “Basic” dogs are in the 5 to 12-month-old range, I though they were remarkably well-controlled as their classmates paraded by them, close enough to tackle (were they not all in their dressed and working mode). It was chilly outside, so we soon went back in, with the puppies practicing “Wait” at the doorway. Then Bob had two dogs at a time work on a series of Basic commands like “Roll” and “Under.” Kyndall seemed a bit sleepy to Steve and me, but she did well. Everyone did. Again I was impressed. By far the most entertaining part of the evening came at the end, when Bob had everyone put their dog in a Down Stay. 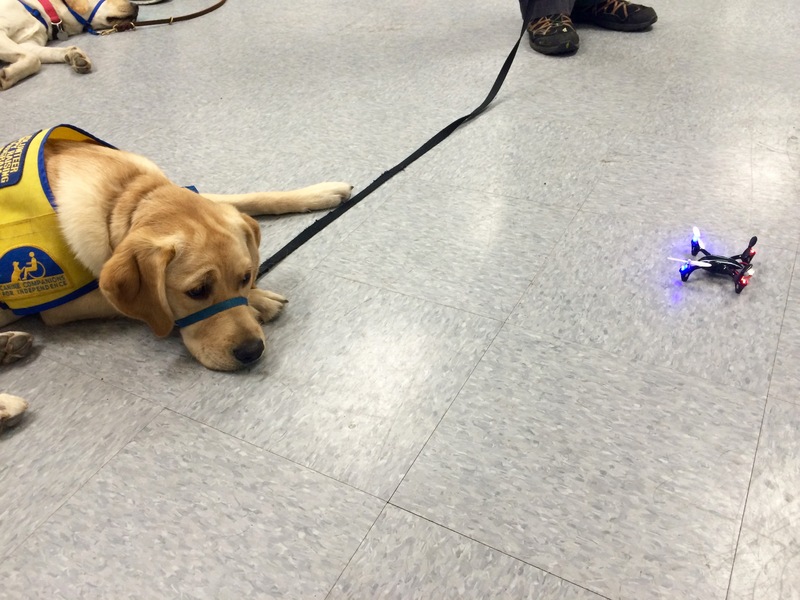 Then he broke out a little quad copter and directed it to hover near one area after another. This woke everyone up. Ears lifted. Noses pointed. 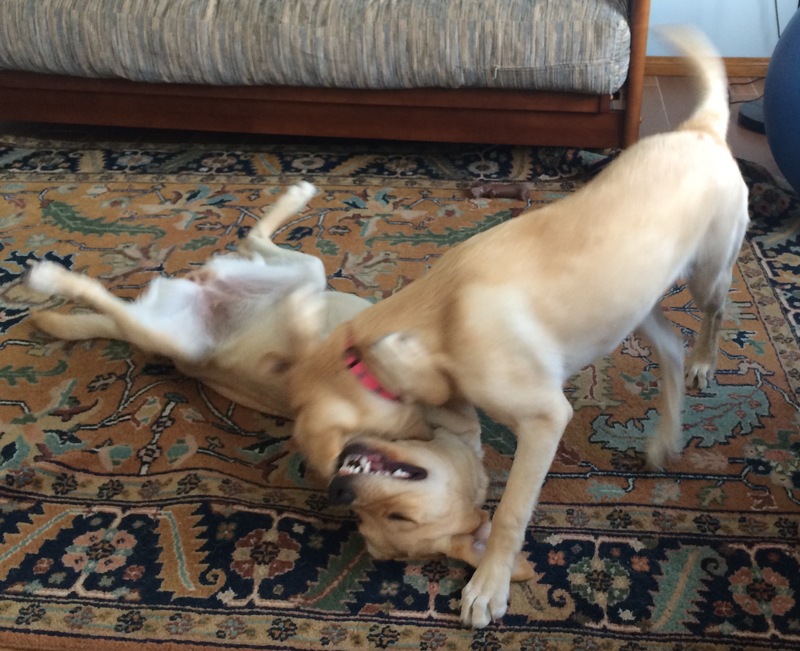 It was enough to send a roomful of normal puppies into a barking, jumping frenzy. But even though Bob had the device zoom up and jump about, Kyndall’s classmates stayed in position, beautifully obedient. The quad copter was pretty creepy. But these guys were held their Down Stays well. As for Kyndall, she did well at first when Bob zoomed the copter over and taunted her with it. Kyndall seemed to be thinking: if there’s ever a time to look worried, this is it! But then it came a bit too close, and she jumped to her feet. Happily, it was time to adjourn for the evening. There’ll be plenty of other opportunities to practice being good in at the Basics. Steve and I have become a little concerned about Kyndall’s interest in birds. Too keen an interest in chasing them is something that could get her released from Advanced Training (down the road.) She had an experience this week that confirmed she finds them fascinating. I was visiting my aunt Therese and cousin Tom. 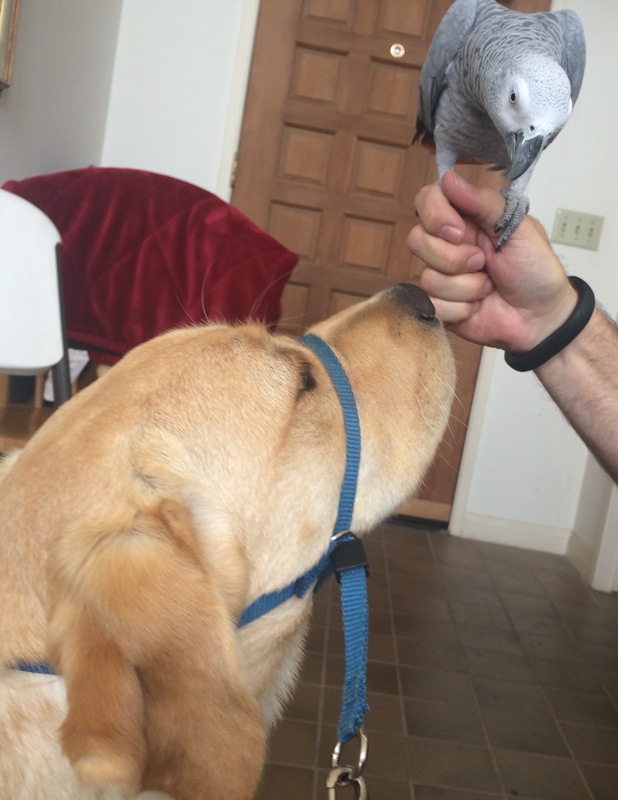 They live with Duke, a sweet-tempered, very furry mixed breed dog, and Reba, a charming 2-year-old African gray parrot. I took Kyndall along on the outing, and for the first part of it, she focused entirely on Duke. She wanted to romp with him but I made it clear that wasn’t going to happen, so she settled into an admirable Down Stay. Only after maybe 30 minutes did she notice Reba’s cage. She stared at it as raptly as a religious vision. 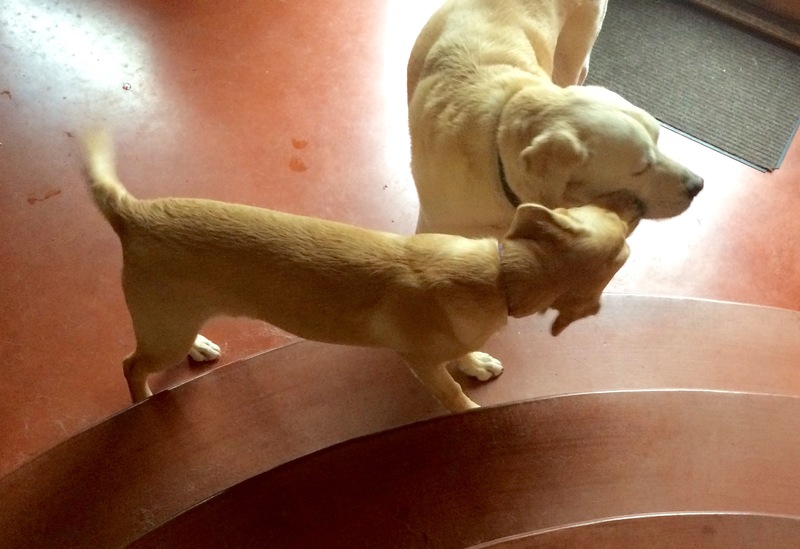 When Tom brought Reba out for a closer encounter, Kyndall was all but quivering. She didn’t make any aggressive moves (to Reba’s great relief). But clearly this is something for our To Do list: Work on bird desensitization!